Sunday is here, and I hope you’ll forgive me for starting off with a blatant plug. I have set up a page on Ko-Fi, where you can buy creative people a coffee (or, in my case, a cup of tea…or two donuts) by making a small donation. If you want to support what I do between books, this is one way to do so. More after the cut! There’s a Kickstarter under way right now that I recommend to all fans of nerd music. Sarah Shay is working on her first studio album, You Have Queer Street Cred, and needs help to pay for the production and distribution. She’s almost reached her funding goal, but could use some help to reach her first stretch goal, which would add a lyric booklet and let her pay the musicians she’s hired a bit more. Check out her music, and consider backing her! Steampunk gathering alert! One of the very best steampunk conventions, Wild Wild West Con, is coming up in just a few weeks! It’ll be held March 1-4 at the Old Tucson complex in Tucson, AZ. There’ll be robots, dinosaurs, tea, a concert by Abney Park, and shenanigans, and Madame Askew and the Temporal Entourage will be out in full force! Freshen up your compliments and keep an eye on your lemons! And finally: The Misbehavin’ Maidens, that delightful and risque nerd music quartet, recently commissioned a run of six-sided dice with the band’s logo on the “6” side. They were intended for sale at conventions and concerts, but they held a one-time mail order sale last weekend, and I scooped some up. 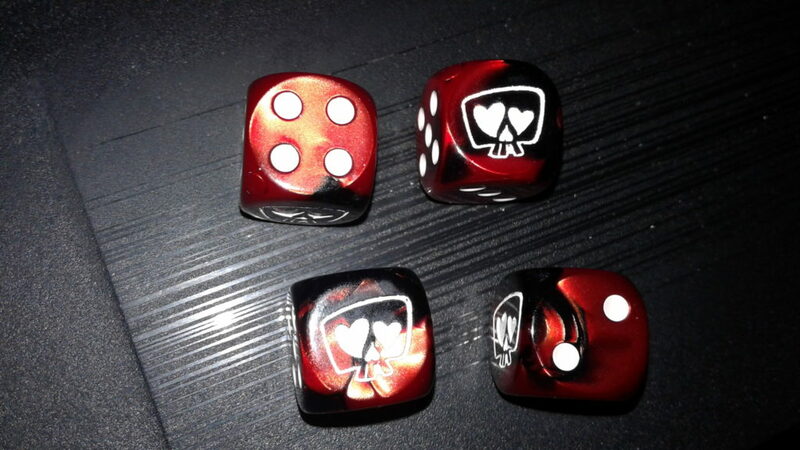 I do want to use these to roll up a D&D character at some point, but it may have to be a multi-class rogue/bard.